What are the benefits of using a treasury management system? How can a Return on Investment (“ROI”) for a treasury management system (TMS*) be calculated? 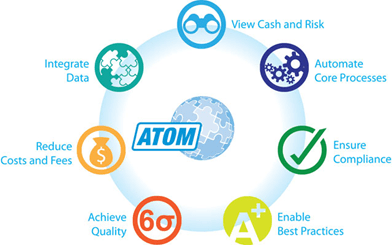 Why would a company want to implement a treasury management system? Many CFOs and treasurers expect a return on investment (ROI) analysis when considering implementing a treasury management system. But a TMS ROI can be challenging to calculate because many important TMS benefits are qualitative. Financial Sciences has developed a comprehensive ROI calculation method that analytically incorporates intangible as well as savings benefits. Download our free whitepaper and learn how to calculate a TMS ROI that shows management the positive financial return on a TMS investment for your organization. Read how to calculate an ROI for a treasury system here. Compliance and Best Practices A TMS promotes best practices including the adoption of superior operational practices, adherence to company policies and procedures, and conformance with current regulatory standards. • Ensure company correctly and dependably complies with applicable regulatory and accounting standards. • Promotes the use of best practices. Risk Management A full function TMS provides embedded risk management allowing Treasury to proactively manage, monitor, and report on operational, financial, and credit risks, regardless of where these activities are performed around the globe. • Allows Treasury to proactively manage risk exposures and identify mitigation options rather than handling risk exposures after the fact. *What is a Treasury Management System? What is a treasury management system? A treasury management system (also known as a treasury and risk management system) is a software solution that automates and integrates all of a company’s core treasury functions including banking, cash and payments, forecasting and liquidity, investments and debt, hedging, risk and compliance, and financial reporting. Acronyms for a treasury management system include TMS, TWS, and ETMS.